Mansfield, 12 @ Foxboro, 2 – Final – Mansfield earned its 10th win of the season and clinched its spot in the state tournament with the win on Sunday morning. Sarah Cahill scattered 10 hits and struck out five Warriors to pick up the victory. Mady Bendanillo, Liz Mackin, Marissa Staffier and Kerran Holmes each had two hits for the Hornets and Staffier also drove in three runs and, according to head coach Lori Letendre, saved a Foxboro homer in the seventh inning with a catch at the wall. Hockomock League Championships – Click here for over 100 photos from the event. 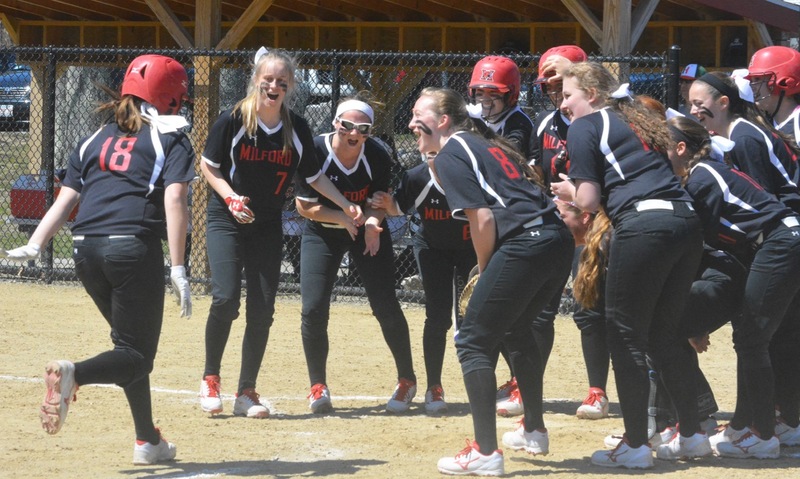 Mansfield, 3 vs. Holliston, 0 – Final – Sarah Cahill scattered five hits and struck out seven in a complete game shutout. Mansfield opened the scoring in the first on a two-run homer by Mady Bendanillo, plating her sister Kara. In the sixth, Mansfield added another run when pinch hitter Hayley McGowan drove in Marissa Staffier with a sac fly. Head coach Lori Letendre said that Mady Bendanillo also made a “fantastic” catch in center. Franklin, 7 vs. Natick, 4 – Final – Franklin freshman goalie Gianna Cameron turned aside seven shots in net and Dana Lewandowski caused five turnovers and played well on defense.